These rolls have a succulent meaty texture thanks to tempeh, which not only tastes awesome but is high in fiber and a complete protein! Use our sushi tips to ensure perfect rolls. Empty hot rice into a large glass bowl. Sprinkle with about rice vinegar and 1 tsp. sugar. Fold rice gently with a large spoon or rice paddle. Rice should be moist and have a mild vinegar flavor. Cover with plastic wrap. When rice is slightly warmer than room temperature it’s ready to work with. Great recipe! I put in some yellow pepper into my sushi roll and it was amzing! There are not enough comments for this recipe! I just made this for the first time last weekend and already had to make it again. I LOVE this sushi. YUM. My kiddos love it, too. 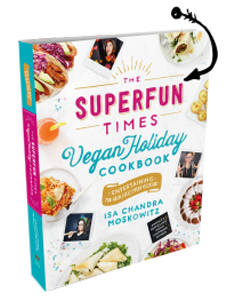 I know this is an old post, but I found the recipe in Veganomicon and I have a question…. I live in a small town in IL and can’t seem to find hot chili-sesame oil. Do you have a suggestion for substitutions? We have a small Asian grocery and they carry hot chili oil…would that work? Yes, totally. That plus a splash of sesame oil = perfect. Made this today! They were pretty good. I too couldn’t find Hot Chili Sesame Seed oil so I just combined sesame seed oil and hot oil. It was okay, but I’d like a little more spice factor. Just something I’ll have to tweak next time, my mixture may have been off! My partner and I made this sushi together the first time we met. We’ve been together since that night, going on four years, have a 2 year old son and get all nostalgic whenever we make this… So, just a note to let you know that your sushi is probably the reason I have such an awesome little family. 🙂 Thanks for being so rad and prolific. These rolls are so amazing. i prefer to make mine using brown rice. Just be sure to use short grain brown rice. They are a little more difficult to roll, but it is worth it. Also, i use siraacha instead of the hot chili oil. It is addicting. Hey there, You’ve performed an excellent job. I will certainly digg it and in my view recommend to my friends. I see someone else, leila, saying I can use brown rice instead of white, I want to try it like that because I like the flavor of brown rice better. Have you ever tried it and any advice? What an easy and great idea! Thank you so much for the idea!